Four years ago, I wrote a series of blog posts, which went on to become “How To Be Creative”. Since then, it’s been downloaded well over a million times. The PDF version alone has been downloaded over ninety thousand times, and is the number one most downloaded manifesto on ChangeThis.com. I am happy to report that I have just signed a book contract with Portfolio Books [a Penguin imprint] to develop it into a book. Portfolio, by the way, is the same imprint that publishes Seth Godin’s books. We even have the same editor, and I’m told the book will have the same graphic designer that designed Seth’s “Purple Cow”. Of course I’m excited and happy. Not only do I have a book deal, I have a book deal with a second-to-none, blue chip publisher. Big thanks and kudos to Seth for introducing me to them. This deal might help better explain why I recently ensconced myself in Alpine, Texas. The move was not completely random. I needed to write more. Needed to be somewhere with lots of peace and quiet. At least until the final manuscript is signed off. Yeah, it’s a terrific opportunity. But like it says in HTBC, “Keep your day job”. The book may become a bestseller, it may only shift a few copies. I have no idea. Nobody does. Some people dream of one day becoming a full-time book author. I feel fortunate to have never been smitten with the bug. I’m going to continue doing exactly what I’ve been doing for these last four years- drawing cartoons, blogging, writing, consulting etc etc. 4. “The Title Is Ironic, Stupid”. Telling people “how to be creative” is a bit silly, when you think about it. Generally, people either are or they aren’t. When I wrote HTBC, I certainly wasn’t trying to slip into some sort of New-Age, “Unleash-The-Fire-Within-You-Creativity-Guru” schtick. All I was thinking about was a short, practical, real-world list of advice that would come in handy to somebody say, 10-20 years younger than me, somebody with the same “creative bug” I had when I was just starting out in the world. I was just trying pass along some valuable, pain-saving lessons to the next generation that I had learned along the way. No more, no less. 6. What have I learned about “Being Creative” since 2004? Very little, if truth be told. The first round of HTBC had 26 chapters, 10,000 words and took 6 weeks to write. Since then, I’ve added another 10 chapters- about 3,000 extra words. I’ve not had a lot to add to the original list, it seems. The good news is, there’s nothing in the original 2004 version that I’ve had to take out completely or hugely modify. Most of the stuff seems to have stood the test of time pretty well, which I take as a favorable sign. I have to get the final manuscript finished by August. We’re guessing early 2009 for its release date. I can’t wait! Loic Le Meur and I were having this conversation recently. The basic tenet of the conversation was, “The best thing about being a blogger is the people you get to meet.” I have found this to be true and self-evident. When I was younger, the people who inspired me the most professionally were famous, dead, or both. Since I become a blogger the people who inspired me the most became good friends of mine. We hung out. We drunk beer. We ate pizza. It wasn’t a big deal, it was just… lovely. Back in 2004, my blogging buddies and I knew we were onto a good thing. Something powerful and creative and earth-changing. But that’s not the main reason we liked it. We liked it because we enjoyed it, because it was interesting, because of the smart, passionate, fun people we were starting to hang out with. A decade from now, maybe blogs as we know them won’t even exist. Maybe they’ll call them something else. Do I care? Not really. What matters, like Loic and I talked about, is the people you get to meet. That’s where the magic lies. Ten years from now, these people will still be around, geeking out on the internet at the latest WHATEVER that’s coming down the pike. They’re not going anywhere, and Thank God for that. So Big Thanks to Everybody for reading gapingvoid over the years. I could not have done it without you, without a constant stream of bloggers and readers to make me think and to make me feel inspired. From the very bottom of my heart, Thanks Again. You guys rock. I so look forward to owning & reading your book. Congrats. That if awesome news Hugh! I honestly can’t wait to get my hands on the book. Saw your announcement on Twitter and wanted to wish you congratulations! The real-time opportunity to make an impact on people, knowing that they’re just friends you haven’t met yet, is amazing. Best of luck with the next stage of the publishing process. Here’s to dreams come true, even 20 years after we develop a vision. many congratulations Hugh, i personally found how to be creative really useful, especially 2. I had no life in my 20’s. Get used to the same…Definitely made me think about how I’ve managed to stream ahead of some of my peers through believing in exactly the same thing, and how at 24, I’m going to have to keep it up. Also on blogging and books, I’ve just started one up around my experience writing my first novel, (http://www.cementum.co.uk) which was partly due to yourself, you blogged about how if you want a book published to blog about it… So thanks for the inspiration and keep up the good work, etc. looking forward to Book and Con’grats on this new gig !! D’you know, I think thats the Internet Revolution in a nutshell. rock on for real – Hugh – that rules! 2.) Your 2005 blog post about Preston Reed. Preston’s work was a massive inspiration on me since then. thanks again hugh – congrats – you totally deserve it! Congratulations, Hugh! I’ll definitely be among the first in line to purchase it when it launches. Absolutely brilliant news – well done – looking forward to it – and thanks for clarifying Alpine – I was wondering !!! Congratulations. It’s always great to see people doing what they love well and getting rewarded for it. did you post this earlier and then withdraw it? I went to comment on this fist thing this morning but it told me it did not exist – even though I was on the page! Congratulations on the book deal Hugh! I look forward to cracking the spine on my copy. Reading HTBC all those years back was a great inspiration (and has resulted in me to spending far too much time reading gapingvoid ever since). Kudos and you deserve it, Hugh. Thank you for all you do. Well done Hugh. I hope we can meet up again sometime soon. Nice one, Hugh! A book worth buying, too. I hope you’ll be prepared to toast it and have a little book signing back in Edinburgh some time in 09? A public congrats to go with the DM’d congrats, Hugh! And yeah, spot on with the last bit about the people you meet. Most of the best friends I have at this point are people I met through blogging and then got have beers with. Especially yourself. Congratulations! I look forward to reading your book next year. Don’t know what you mean by “advice that would come in handy to somebody 10-20 years younger than me”. Hell, I’m over 50 and read it several times. Congratulations! You deserve the recognition. Congratulations on the book. Fantastic news. Very happy for you. You give me inspiration that someday I’ll publish mine. Been following your writing (and career) since I saw you speak at SXSW 2007. You’ve been hugely influential to my business world-view and self-view. The book should be a great addition to my new hire reading list. You got this deal because you simply deserve it BIG TIME. I look forward to the Chapter introducing cartoons! Way to go, Hugh. Good form! Point 8 is awesome. Puts into words my thoughts about why blogging is so wonderful. Congratulations! Hugh you deserve the recognition and can’t wait to see what you do next! I’m happy for you Hugh. I read HTBC once a month and follow you on twitter. Keep doing you! Great stuff, well done. Can only echo your thoughts that the best thing about blogging is the people you meet. Two of my best friends ‘introduced’ themselves via my blog, and I doubt relocating to where I am now would have been half as successful if I wasn’t spewing stuff out onto the interweb. Congrats again. Congrats…I look forward to reading the finished product! I too agree that one of the best things about being a blogger is the people you get to meet. How cool is it to show up in a random city and not really know anyone, but still be able to find a dinner companion or tour guide? Congratulations! Before I think I knew the correct spelling for blog I found your “How to Be Creative” post..it was one of a few seminal moments in my own life as a blogger. Looking forward to the book. Awesome news. Can’t wait to read the book. Well done and well deserved! Good and great news Hugh. Now I can boast I met a hero of the online revolution in a Tesco at Newbury pushing a shopping cart around with a gorgeous blonde lady perched on it urging shoppers to buy bottles of wine! Of course for peace & quiet to write, you chose Alpine. I would’ve also taken a peek at Outjo in Namibia before settling on Alpine…..! If it’s desertlike shrub, big blue sky, no rain, sunshine, peace and quiet you need then very little between the two. Plenty quiet at Outjo and the pub is only a few hours drive away at Swakopmund or in the opposite direction to Windhoek. Best beer in the world – Windoek Lager. Getting one down your throat has helped to write hundreds of books. I jest and admit that the quietitude you are relishing at Alpine seems like heaven to many of us. Aaah the pipedream goes on. Hearty congratulations and so well earned. A million congratulations Hugh – I’ll buy some books for my company. finally! well done man. you earned it. If a picture is worth a thousand words, what is one of your drawings worth? If I had to condense the entire Bible into a single line, it would read something like that too. It seems that we’ll have both books released about the same time. I must say that you have been an inspiration to do my blog the way I did (even tough in sleep time for a while now), for the book and the marketing. I have very happy for you and thx again for your contribution to all. Fantastic news Hugh! Can’t wait to read your book. I already know it’ll be great. Congratulations! Hey You… No-One deserves this more than you…!!! Congrats! and your single line for point 6 is fab.. I always knew that this day would come. There are a lot of us out here that have always had total faith in your talent and abilities. Look at the good you’ve done for Thomas and so many others (including me). Good karma has come your way. Follow this path without any question or doubt. This is your destiny. Congratulations, Hugh! Look forward to seeing it print. I love the one-liner, by the way. Be well & enjoy your creative/peaceful time in Texas. Congratulations! May you follow in the footsteps of many great writers … get up early, write ’till noon, and enjoy the rest of the day at the cafe. Careful – people have been nailed to crosses for saying things like that! Congratulations on the book deal Hugh. Congratulations on the move to west Texas as well. It always seemed to me like one of the more intriguing parts of the US. After listening to Explosions In The Sky I imagined that’s what west Texas must *sound* like. I highly recommend them, by the way; great writing music! That’s great news. Now get busy and set up a site to pre-order the book. I’m one of your million downloads and I’m ready to buy the book. Look forward to read it. Big congrats from all the Hughettes! This must be book news week. Just read that Darren at Problogger has a book coming out too. I’ll have to expand my book shelves. Congratulations on the book deal. I really enjoy your blog and art. Can’t wait for the book. Go work on it! Congrats! Also, congrats on the first-line mention in Wired. Congrats; HTBC in list-form is one of the things that I have pinned on my cube-wall. Sir, I’m proud to be your fan. Congrats! Good going Hugh….you richly deserve it. I’m super happy for your book deal today! sweet! You have lots of good info, advise and ideas to share … keep `em coming! Even though you don’t know me Hugh I am a HUGE fan of your work. Congrats! 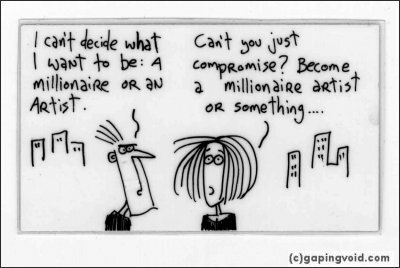 I tell as many people as I can about Gapingvoid. Great conversations, ideas, point-of-views, discussions and insight to the realm of marketing, branding, and life. Love, love, love it! Continued success! And in the words of Seth Godin (paraphrased), there’s really no such thing as an overnight sensation. Those that succeed have often been working very hard at it for quite a while. Hugh, Your messages sound a bit like Ebay, sell stuff for the sake of selling it, software for the sake of software, and yes Bloggin’ for it’s own sake. There’s no content here, it’s an Ayn Rand style of survivalism. Let’s all go to Beijing, they’ll pay us. P.S. Resoundingly positive comments are underwhelming. there is not a big enough “yay” in the world to celebrate this news! Ditto to the comment re: setting up a pre-order page. I’d buy it right now even if it were years from publication. Seriously. #8 really got me. You rock Hugh and wish you all the best. I have been reading regularly for about a year now. Terrific stuff and the book deal is not much of a surprise, really. You have strong insights and a book makes sense to me. I look forward to reading it, and when we cross paths (I am pretty sure we will, eventually) I’d like you to sign it. I hope that you are going to expand on the “social markers” and “social objects” theme. While I think a lot of your work is damn good, I think these concepts deserve further investigation, and are your best, most brilliant ideas. I would love to see these examined further. Congrats from the bottom of my fan-heart. I too left office water coolers, etc to move to write my book in the middle of nowhere. It’s working fabulously well. Just don’t get wifi because if you can check email from the laptop you’re writing on, distractions swallow the writing hours. And don’t tell anyone your phone number. That’s all. Cut off from water cooler is bigger breathing space than the office people know. Hugh, after all these years, your voice has retained a clarity and integrity that will sing in book form. I think you’ll sell at least a few (thousand) flats of HTBC! Fantastic Hugh ! I was just blogging about your “smarter conversations” last night. Congratulations. I feel great about it, because once in a while one finds a set of words that mean “truth” and one hopes it will reach a greater audience. You -SHOULD- reap the financial benefits. HTBC was the first blog post that really grabbed me and wouldn’t let go. Can’t wait to read more. Congrats on the book deal! In my experience, whether or not the book sells well has as much to do with how willing you are to “get the word out” as to how much the publisher does to get the word out. When it is ready, I would be willing to send a notice to all my people (my list isn’t huge, but I do have a list, at least.) You could probably get others to do the same, to get the buzz going. In any case, GOOD LUCK with it!! !